Determine projects that you should invoice to clients. Understand your non-billable hours. Don’t let budgets catch you by surprise. 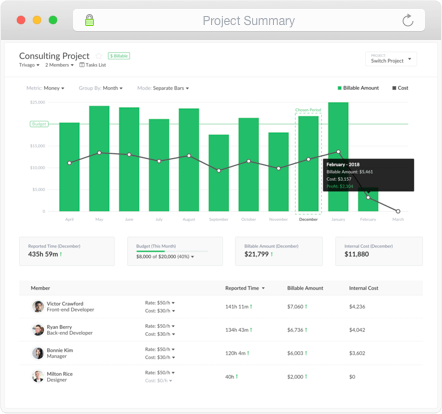 Keep track of all your project budgets by costs or hours spent. Set project limits so your team does not go over. Get a notification when the time threshold is nearing. Monitor team’s workload. Avoid overcommitting staff members on your projects. Forecast the staff availability and make accurate plans of their work accordingly. Manage people’s time off and availability. This way you know exactly when to expect them at work. Find any task and start timer, report time for past dates, leave extra notes … all from a single page. 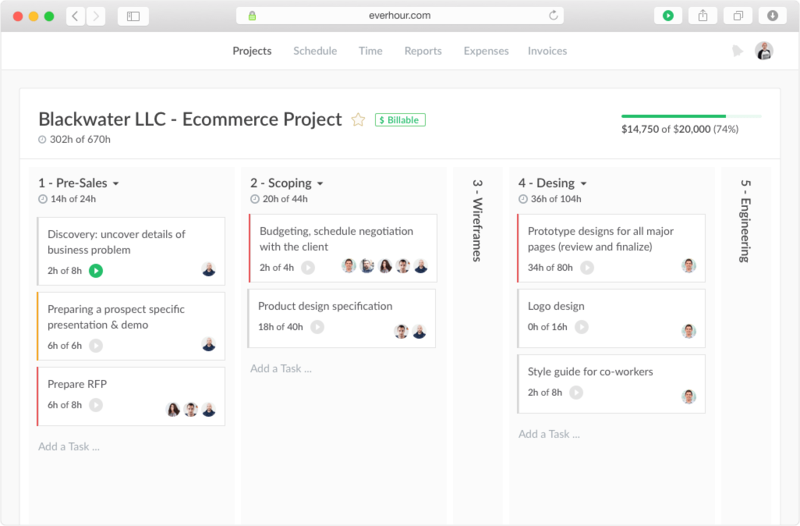 We integrate time tracking with the most popular project management apps: Asana, Trello, Jira and more. You can bring up Everhour to track time right from your browser toolbar with a single click. Boards provide your team with a true representation of the scope of the project. We don’t force you to follow any principles. Create boards to suit how you work. View aggregated history of your expenses grouped by category, project or member. Mark your expenses as billable and automatically pull them onto an invoice for your client. Assign billable expenses to projects and they will be considered in the budget calculation. 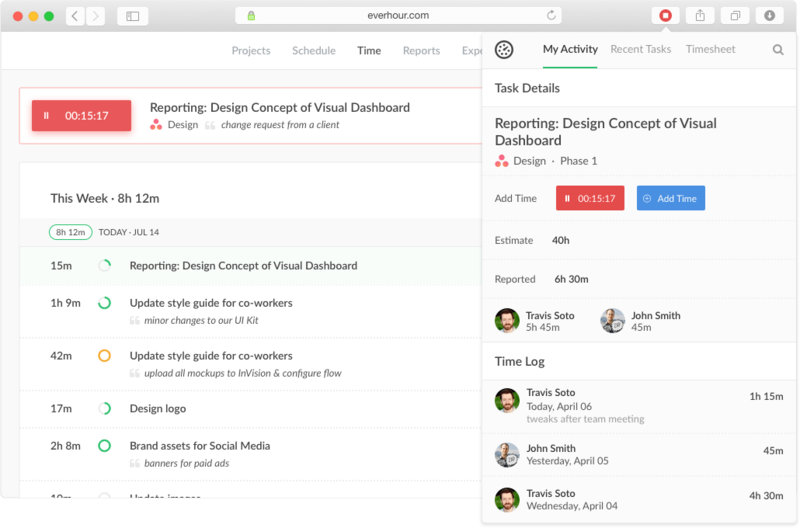 Immediate visual insights into timesheets, employee performance, and more. 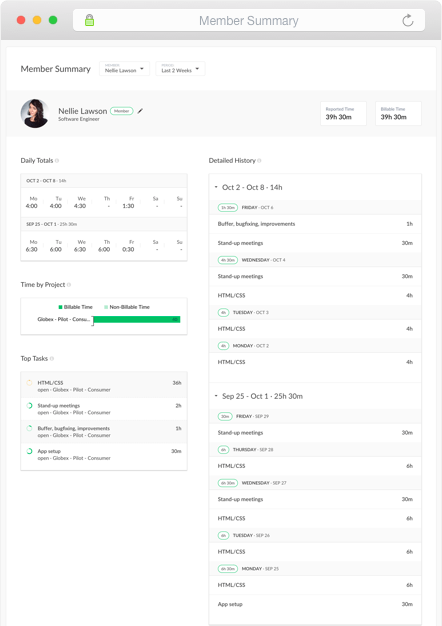 Home page helps you quickly evaluate what is going on in your team, how everyone performs on their tasks, as well as makes adjusts on the fly. Live dashboard makes it easy for you to find who is working at this moment and on what, their recent activities for today and identify those who didn’t report a minute at all. Member profile allows seeing the summary of a member’s work, with top tasks and details on each time entry they made. 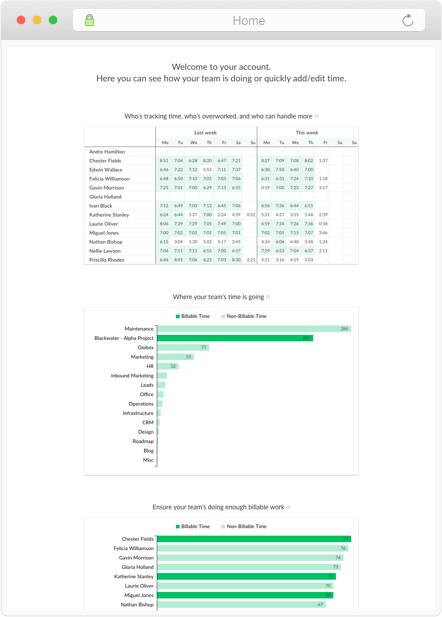 Project summary allows seeing the time and money spent on a project, compare profit and cost, check the individual progress of project participants. 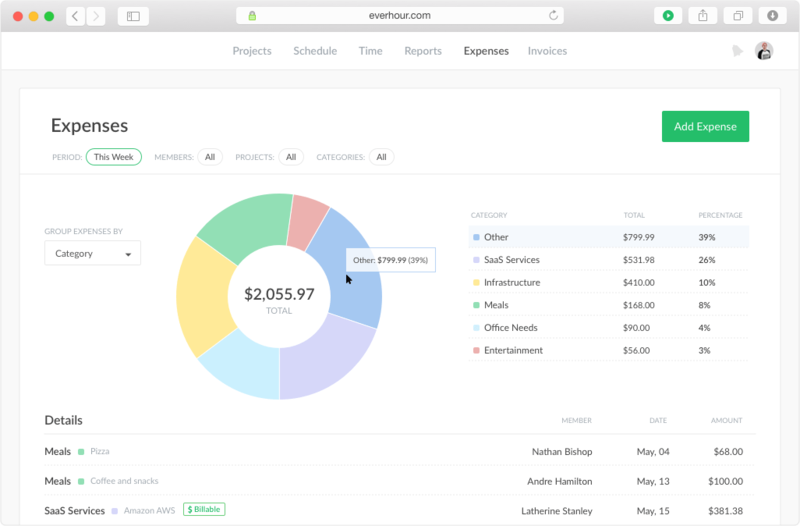 With Everhour you can customize your reports so that you only see what’s important to you. Create accurate invoices from the logged work just in a few clicks. Watch the reported time and the accurate time invoiced. Pull the billable time you’ve tracked into invoices in a single click. Send invoices and record payments. Connect with QuickBooks or Xero and we will automatically copy invoices over to them. Everhour is designed to enhance and collaborate with your favorite tools. 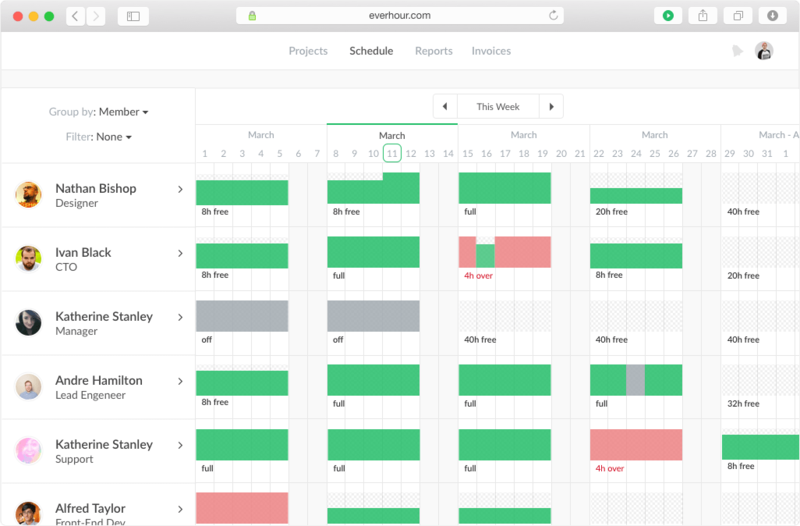 Everhour natively integrates with your project management app so you can track time on tasks right from its interface. Improve your efficiency on sales-related activities by tracking time dedicated to completing them. 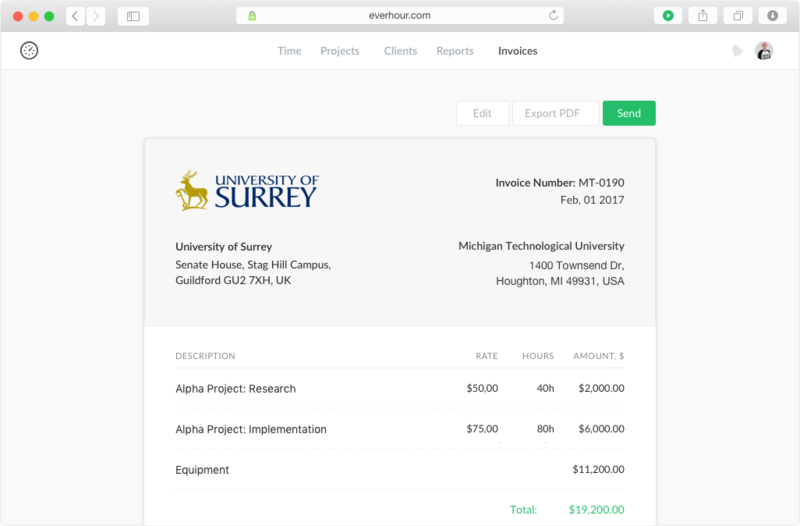 Turn billable hours into an invoice automatically copied to your accounting tool. No double entries. Track time from your browser toolbar. 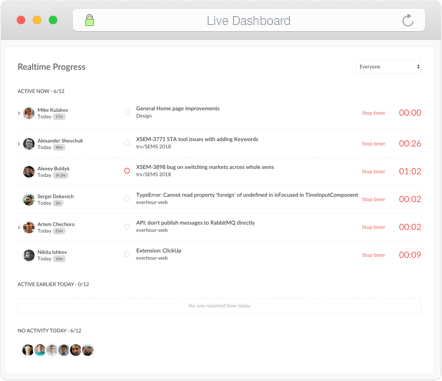 Everhour also brings time tracking right inside the most popular project management tools. So your timer is just a click away. 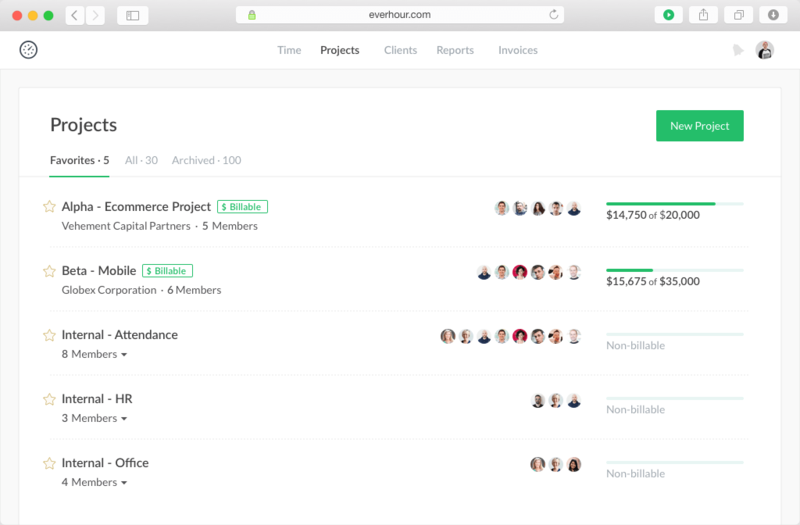 Absolutely love how Everhour integrates with Asana - we stay organized, know who has worked on what project for how long, and can group all the projects by clients, making billing way easy! As a freelancer developer with my own clients as well as subcontract clients I have many different directions I get pulled. Before Everhour tracking my time on these projects was impossible and I was missing billing time. 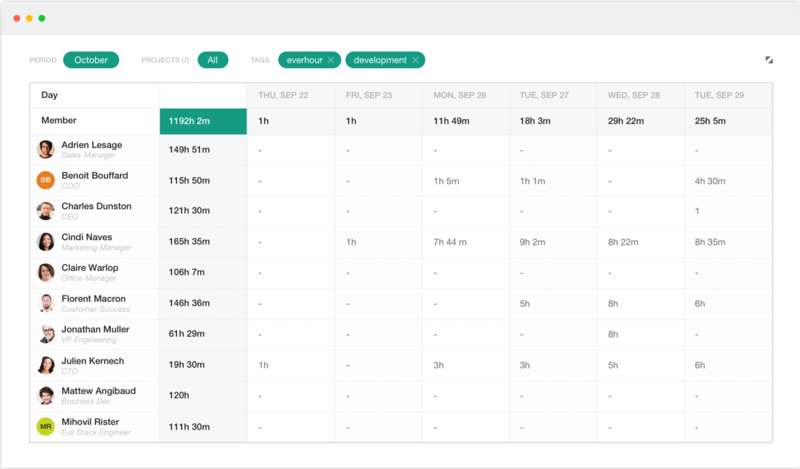 Everhour has already paid for itself by helping me track time I was missing in client projects. It is easy to use, has friendly customer service people and the reports make it easy to invoice clients and track projects. Pleased with the real-time logging transparency and integration with Asana. I like the way it shows the time log used in our projects. It’s great for remote teams to see who is working on what in that specific moment.